Learn about exposure compensation in photography and see how it can help you quickly adjust your exposure and get correctly exposed shots. What is TTL in Photography? TTL stands for through-the-lens and it's a function that some speedlites and strobes have to automatically calculate the flash power needed to expose a scene. In this post I compiled the maximum flash sync speed for today's most popular camera bodies to help you get that info all in one place. Here are 15 photographers that do amazing black and white photography work and that you can follow on Instagram for photography inspiration. Let's quickly go over what the camera metering modes are and what they mean. We'll cover spot/partial metering, center-weighted average and evaluative (matrix). A tip to improve your skin and color tone retouching in Photoshop by adding quick adjustment layers to bring out details that could otherwise be hard to see. Interested in tethered photography, but not sure where to start? This guide should get you up and running with shooting tethered in Lightroom or Capture One. Wondering about which lens focal lengths are best for portrait or landscape photography? This chart should help out in your lens choice. So you want to learn some new photography and retouching techniques from the comfort of your screen? Just follow these photography/retouching YouTubers. Want to start making use of styles for your RAW photo editing in Capture One? This short guide shows you exactly how to use pre-made styles. Here's how you can save your RAW adjustments as styles that you can then apply to future photos in Capture One Pro. Inspiration is one of the most important parts to help give a boost to your creativity. Follow these great photographers on Instagram for your daily dose. Comparing the technical specs and ratings between the Canon EOS R and the Canon EOS RP mirrorless cameras. Comparing the technical specs and reviews between the Nikon Z7 and the Canon EOS R camera systems. An easy way to take more interesting photos is to use different objects between the lens and the subject to create fun effects. Here are 14 ideas. A very quick way to add some vintage-looking film grain (noise) to an image in Adobe Photoshop. Here's how to easily add some drama to your black and white conversions using nothing but a simple gradient map adjustment layer in Adobe Photoshop. In this quick post I'll show how to do a seemingly simply task in Photoshop: resizing a layer. You'll see though that there are a few tricks and gotchas. In this guide we'll explain what LUTs are and how to use them in Photoshop to create amazing color grading effects. We'll even go over creating them!. 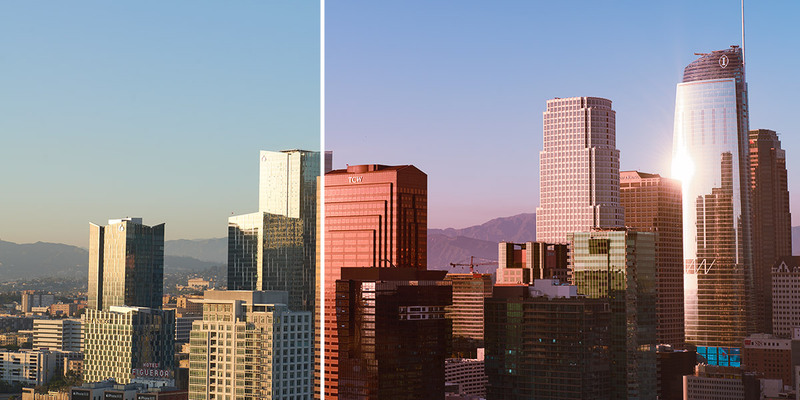 Ever wanted to change a color from a photo to a different one in Photoshop? In this tutorial you'll see how to easily do that using a color range selection. In this post we'll go over some of the key things you need to know about histograms in photography, how to read them and where they become useful. In this quick tutorial you'll see how you can easily turn your exposure-bracketed photos into beautiful HDR images using nothing but Lightroom Classic CC. In this really quick guide you'll see how to create a duotone color effect for your photos in Photoshop with only a simple gradient map adjustment layer. Curious whether you need a light meter for your photography, or about how to use one? This post should cover your bases about what you need to know. In this post you'll see how to convert an image to black and white and create a high contrast look using only a channel mixer adjustment layer. In this tutorial we'll quickly go over how to add a vignette to an image in Photoshop in just a few seconds using a Curves adjustment layer. In this quick tutorial I'll show you how to recreate the sepia tone effect from old photographs in Photoshop using only 3 simple adjustment layers. Capture One 12 brings a slew of new features and improvements for your RAW photo editing needs. Let's explore some of them in this post short post. Bleach bypass is a popular effect for a high contrast and desaturated image. See how you can create such effect in Photoshop with some simple adjustment layers..
Color grading, aka color toning, is an important step for a polished final image. Learn how it can be done easily with nothing but 2 solid adjustment layers. In this quick tutorial I'll show you how you can put together your own v-flats using only gaffers tape, velcro bands, foam core and A-clamps. In this short post you'll learn how to sharpen your images using a high pass filter in Photoshop, for one of the most flexible ways to sharpen. Creating a crazy colorful composite with smoke and all out of a simple self-portrait shot. I took this shot of my Jeep and made it look awesome with the help of Adobe Photoshop and Lightroom. Quickly visualize the difference between hue, saturation and lightness to better understand colors in Adobe Photoshop. Blend modes are one of the most powerful tools available for photo retouching. See what each one of them does. How to recreate the Amaro filter from Instagram with 5 simple adjustment layers in Photoshop. Taken in the streets of Los Angeles at sunset, see how I retouched this shot for a vintage effect. How I retouched this picture of a Jeep interior to give it extra grit and style. See the few tweaks and adjustments I used in Adobe Photoshop to retouch this playful female portrait. It's easy in Lightroom to make skin completely white and create a surreal effect. See how it's done. Double color exposure effects are all the rage right now. See how to create them in Adobe Photoshop with the blending options. See how I retouched this self-portrait by adding a dark red tint to the whole image with just one adjustment layer. See how I used just a few Curves adjustment layers to give this shot a true personality. At its core, photography is about just 3 things: shutter speed, aperture and ISO. Here's a quick drawing to help you learn about it. I took this shot and it was almost a disaster, but I saved it with some clever use of a black and white adjustment layer in Adobe Photoshop. The result is a nice vintage self-portrait. See all the steps I used to take this self-portrait taken in a shower and turn it into a futuristic looking image. Hint: I'm using the LAB color mode. Use a channel mixer adjustment layer to easily simulate infrared-film on your photos. Learn how I retouched this dark self-portrait in just 2 steps in Adobe Photoshop. Learn how I retouched this self-portrait with hue/saturation, levels and selective color adjustments. Easily make beautiful teal-colored skies in Adobe Photoshop.